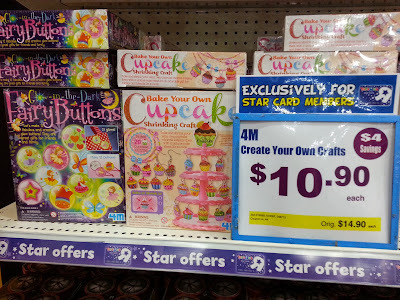 I was looking through the Toys R Us catalogue and this 4M cupcake craft kit which retails at $10.90 for members caught my eye. I told Kiddo about it and she hunted it down the next time we were at the store. 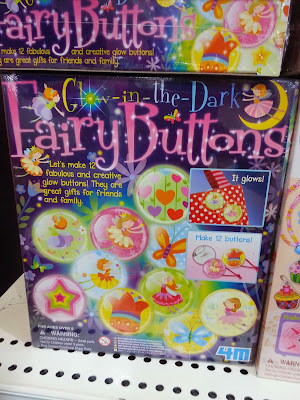 There is also a Glow-in-the-dark Fairy Buttons kit which I am also tempted to get coz I of the pretty good experience with the shrinking cupcake kit. 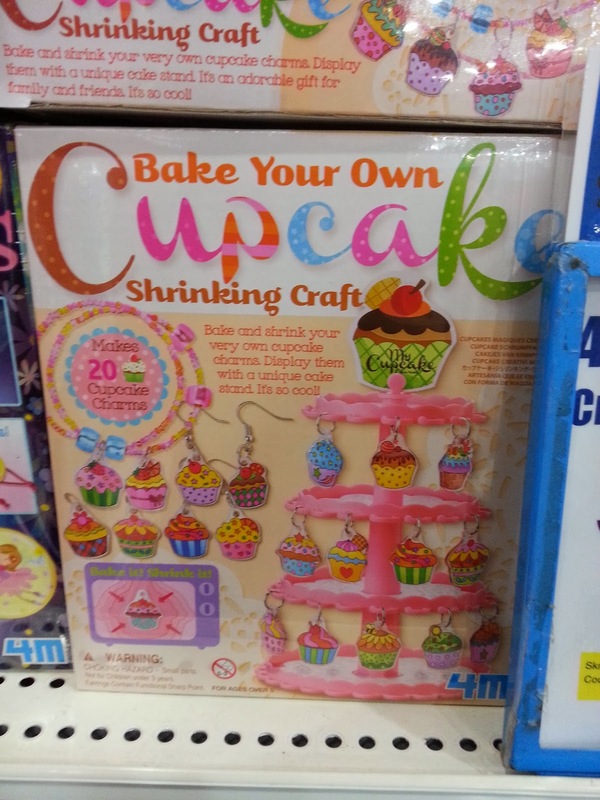 This kit comes with 20 pre-cut cupcake sheets, coloured pencils, some chains and beads as well as jump rings that you'll need for turning the shrunken cupcakes into earrings or pendants. The small cake stand is made of plastic and you'll be able to hang the finished products on it. I don't think that the beads and strings that came with this set is enough for this jewellery making project that Kiddo has in mind. It doesn't matter as she has a Totally Me! bucketful of beads which I have mentioned in an early post. This is how the cupcake sheets look like and you're supposed to colour in on the rough side. I tried colouring in with pens and markers but they didn't stay on the sheets. I guess only coloured pencils work for these sheets. When you're done, pop them coloured side up into an oven set at about 170 degrees Celcius. Within a few seconds, you'll see the sheets curl up and shrink right before your eyes! 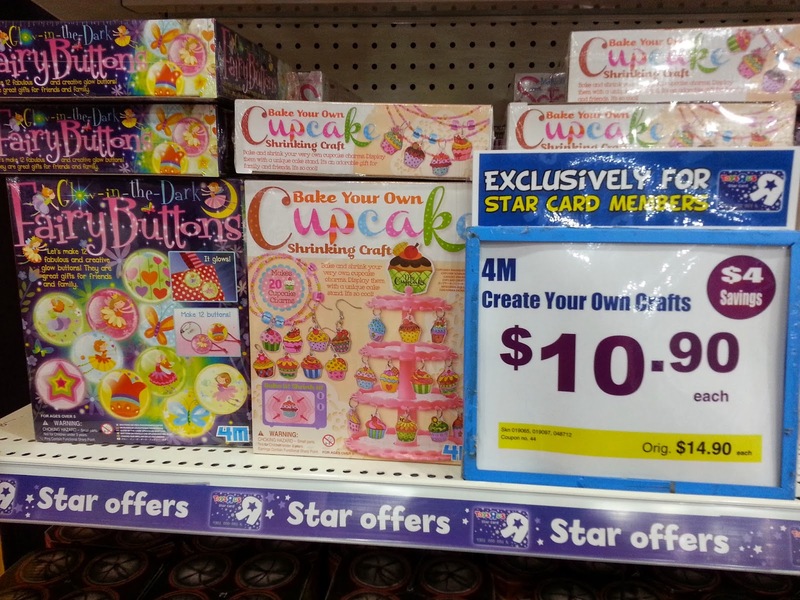 Here are the shrunken cupcakes which are slightly bigger than a 10 cents coin. The colours became darker and more vivid after the shrinking process. I noticed that the cutting on most of the cupcake sheets were askewed and that upset me a little. Coz as you can see from the shrunken ones above, there is a thick white border on some areas while in other areas, they are really close to the outline. This picture below shows that the outline on the left of the cupcake has been cut off and there is a wide border on the right. So for the next pair that Kiddo and I coloured in, I trimmed the sides with a pair of scissors. We have not placed them into the oven coz it was already time for bed but these with the sides trimmed off should look better than the first two that we made. I highly recommending this craft kit, coz it is easy to work on and the end product didn't fail. Kiddo is already making a list of aunts and friends who will be receiving these cupcake bracelets, keychains or earrings that she is gonna be working on. At $10.90 and for the fun and success of this kit, it's definitely a hit for me. I should be getting the Glow in the dark Fairy Button kit the next time we go to Toys R Us.